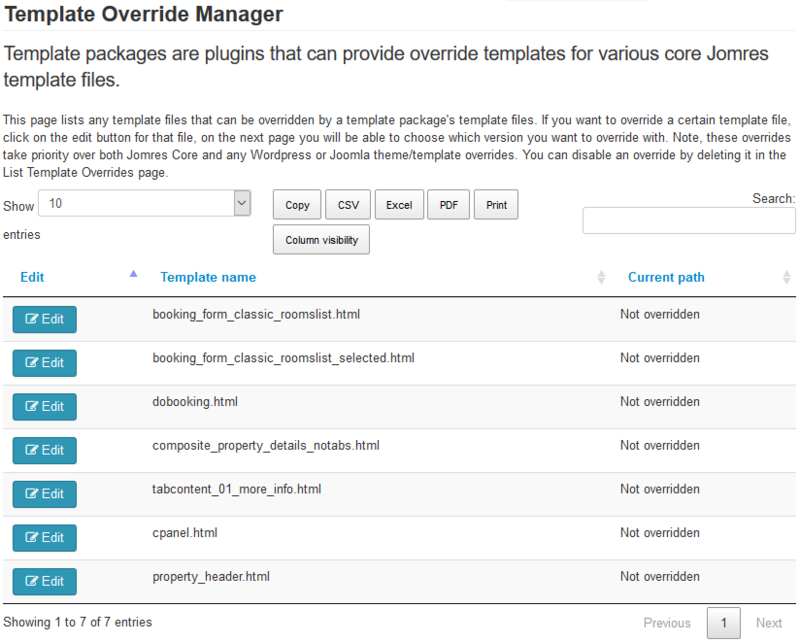 The Template Override Packages feature is new in Jomres 9.9.0. Do not confuse Jomres templates with Wordpress or Joomla Themes. Files delivered in Template Override Packages are purely used to override individual Jomres template files. 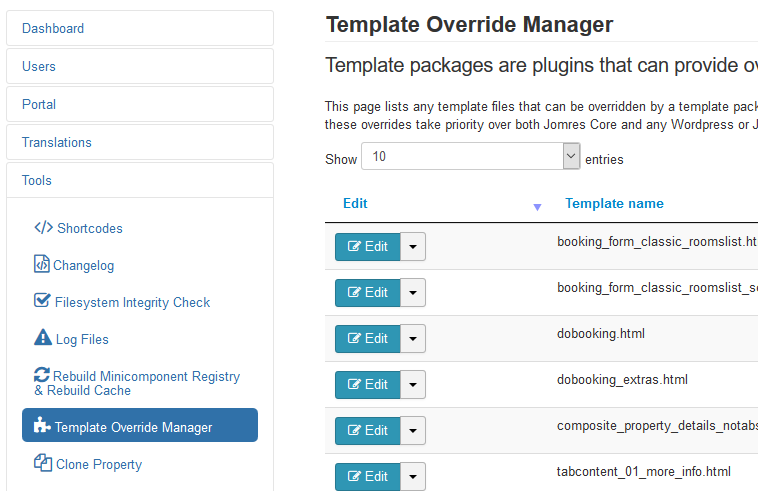 Note : The Template Override Manager menu option will not be shown until you have installed at least one template override package. You can install as many of these plugins as you want, individual templates don't override other templates until they're specifically configured to do so. 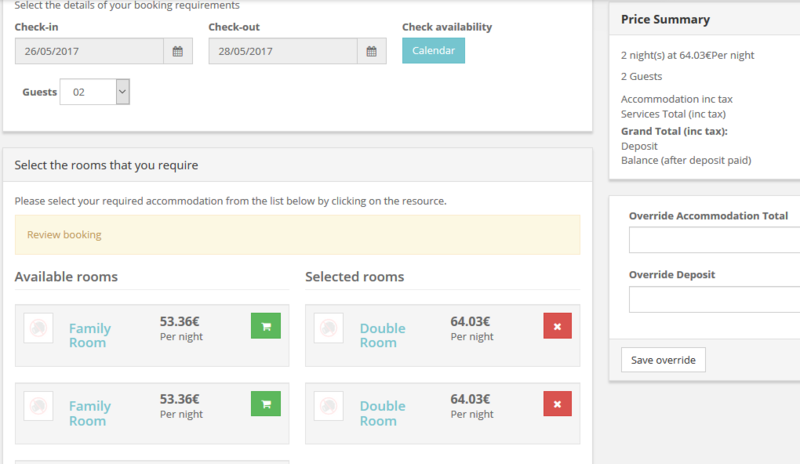 This gives you the ability to pick and choose exactly which templates you want to use in Jomres. In this screenshot we have several Template Packages plugins installed, but none of the overriding templates are active. We can now choose to use a different property_header.html template by clicking on the Edit button next to property_header.html. This takes us to a new page where we can choose which template file should override the default template file. Before we can see how it looks, we first need to activate the three files. To activate a template click on the Edit button and select the description of the overriding template. Can I stop a template override from happening? Yes, very easily. Just use the Delete option as shown here. It doesn't delete the file from your system, instead it just removes the override from the database. Jomres will now fall back to using a corresponding file in the theme if it exists, or the Jomres Core one if it doesn't. Can these template packages be used with other Joomla or Wordpress Themes? Officially we will describe which of our own theme's an individual package's template files (currently just Leohtian) however they are built using Bootstrap 3 standard markup therefore they should in theory work with most Bootstrap 3 compatible themes. In 9.9.18 I reworked this functionality a little. Previous to 9.9.18 you could only easily provide one flavour of template files in a package, e.g. for Bootstrap 2, or 3, because by default the supporting code would only look in the root of the plugin's directory for the template file, when saving the override. As of 9.9.18, when saving the override, the supporting code will also look in /plugin_name/templates/bootstrapX/ where X is the current version of Bootstrap. This allows you to produce different template packages for different flavours of Bootstrap. Another change in 9.9.18 is in response to several feature requests made when this feature was first created. In the /plugin_name/templates/bootstrapX/ directory you can create a subdirectory such as /plugin_name/templates/bootstrapX/5/ where 5 corresponds to a property type ID. What this means is that you can have different templates for different property types.